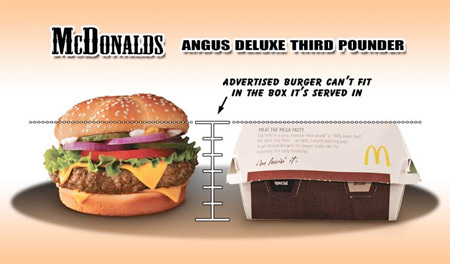 Unique ongoing project by Dario D compares the size of real fast food to the promotional images that are used in advertising campaigns. 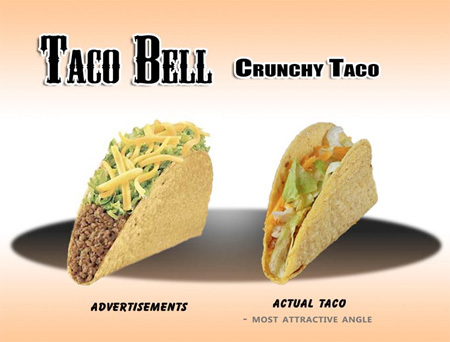 Creative posters highlight the differences between photos of food and the actual burgers / tacos from McDonald’s, Taco Bell, and Burger King. These are all so sad yet true. It’s like a bag of potato chips, you’ll buy a beautiful and big bag but when you open it there’s only 1/3 in it. How the hell do you even know that picture is taken at the same distance and angle as the picture of the box!? The McDonalds and Burger King near me (Indianapolis) must be doing a great job. Most of the burgers come out looking like the Big and Tasty. It’s not spot on, but close enough. It’s called fast food for a reason. They make it in 20 seconds, I’d like to see ANYONE make a burger that perfect, period. 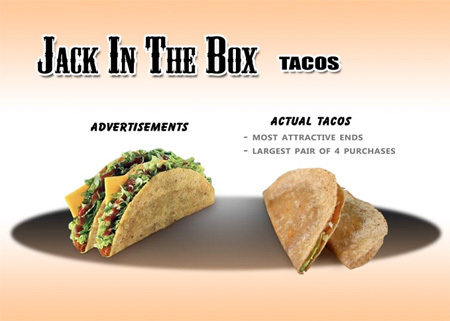 They actually dress up food in ads to make them more appealing, sort of like super models with tons of makeup on. If you want a pretty cheeseburger, go to a restaurant where they take 20 mins to cook your burger, not a drive thru. Otherwise, it gets mushed in your mouth and stomach anyway, who care what it looks like going in? Amen! Next comparison? Sports Illustrated Swimsuit models!!!!! Before Photoshop and after! Well your buying a fast cooked burger which is cheap and easy to produce, if you wanted that kind quality of food you would go to a restaurant or make it yourself. I think it’s weird how people are still shocked by this, its common to market your product to look as best as it can, hence photoshop/render is used for everything these days. 9 out of 10 your going to get a soggy burger which is like those photos but if your lucky, your going to get something closely related towards it. Anyways its a nice reminder but people should know this by now. What is worse is that we eat that garbage. Sadly it just makes me hungry. Not that I’d ever want to be on the side of fast food, since I try not to ever eat it myself, but I have to wonder if this guy is taking a picture of the first burger he gets, or if he jumps to different locations buying burgers until he gets a thrown together POS – and then it’s just isolated, probably to a particular worker at the store, because when I do eat out, I usually get the Big n’ Tasty type burger, and never have I gotten anything like the rest. Perhaps the more shocking thing is how many commenters are OK with the deceptive advertising. It’s worth noting that the “burgers” pictured in fast food advertisements are most likely not even edible burger specimens. No real burger ever looks that pristine. Every time I see fast food advertisements where everything looks perfect and beautiful, I’m reminded of learning that when you see an advertisement for cereal that shows the cereal in a bowl of milk, that milk is probably glue. In my experience, though, the real life burgers do pretty much always look like the real life burgers here. Thank you for fluffing up the burgers. That was a nice touch. Possibly Scott, because the average person knows that burger is going to taste like the pretty one even if it’s been smashed in transit and packaging. The photographer answers your question in the Jack in the box photo: “largest pair of 4 purchases”. 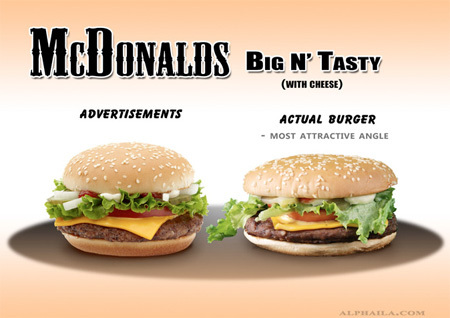 I don’t want to be picky but the Big n’ Tasty actual burger has more sesame seeds than the advertisement. I’d call that a win. Where in the world are you finding these Burger Kings? I’ve eaten a lot of fast food in my days, and these all look pretty accurate except the Burger King ones. 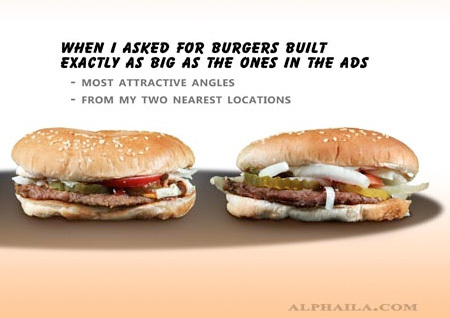 I’ve never ordered a Whopper that looks anything like that, and I can also tell those are NOT the most attractive angles. 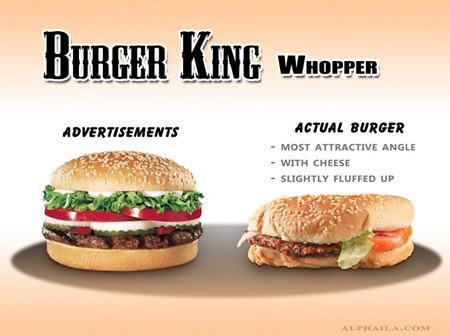 Yeah it’s sad, but they’re trying to show you what’s on the burger in the ad. Not sure why this is considered “unique”. 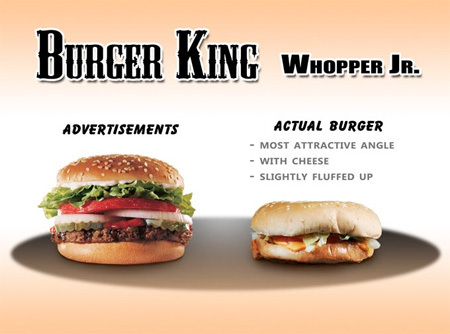 Consumer Reports has been showing advertised vs. actual fast-food pics for years. 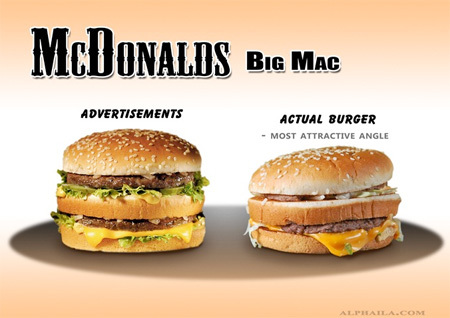 The McDonald’s burgers actually don’t look all that far off. 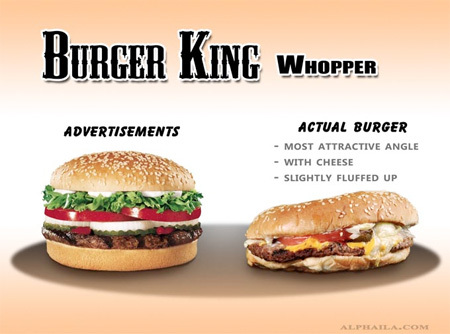 Burger King burgers are pretty tasty, but I’ve never understood why they smash the bejesus out of them.